REKT! ($1.99) by Little Chicken Game Company is a high-octane stunt driving arcade game where you get to wreck awesome cars by doing tricks. 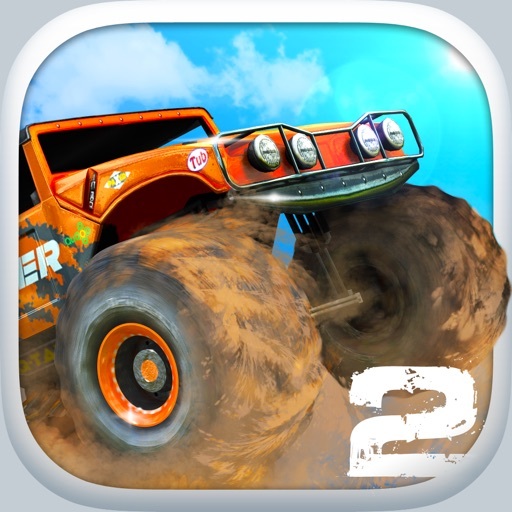 If you enjoyed racing games like Offroad Legends 2 and the like, then you're going to get a kick out of REKT! When times get tough, I like to take my mind off of things with a little destruction and mayhem in my video games. For me, it's the best way to kill some time and de-stress, plus, who doesn't want to see some digital chaos every now and then? 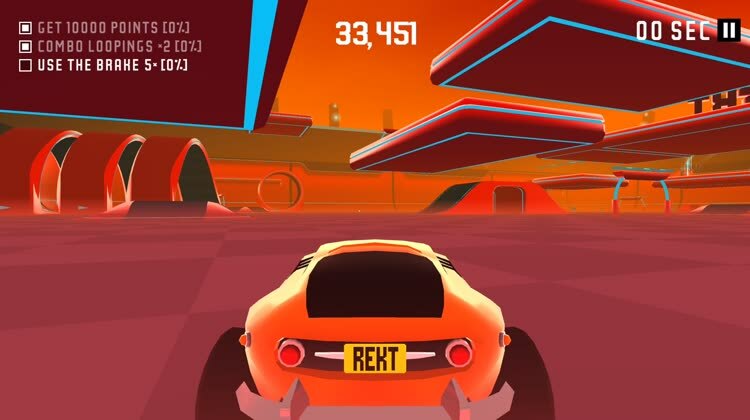 While I'm not always into racing games (Horizon Chase being the main exception on iOS), I liked the idea and concept behind REKT!, as it isn't your typical racer. There are no other opponents to race against, just the clock. Plus, the game looked reminiscent of TRON, so I had to check it out for myself. After spending some time with it, I must say it doesn't disappoint. Visually, REKT! looks gorgeous with the unique and futuristic low-poly aesthetic. Everything is rendered in 3D so it's rather immersive once you get things going. As I mentioned, the arena where you do your stunts in is a bit TRON-like, which appeals to me. It's packed with various ramps, loops, hoops, and other things to do your tricks on while having neon light trims along the edges. The color palette in REKT! ranges from vibrant and bright hues to more muted shades, so it's a nice mix. Animations are smooth and fluid, with frame rates of 60FPS, so I experienced no lag issues on my iPhone 8 Plus. REKT! also has an adrenaline-pumping soundtrack that is sure to get you in the mood to do crazy tricks and smash things. In terms of visual and audio design, I think the developers did a pretty good job. In REKT!, there's only one game mode, and that's pretty much a free-for-all. You pick the car you want to use (you start off with only one) and then hit the arena. 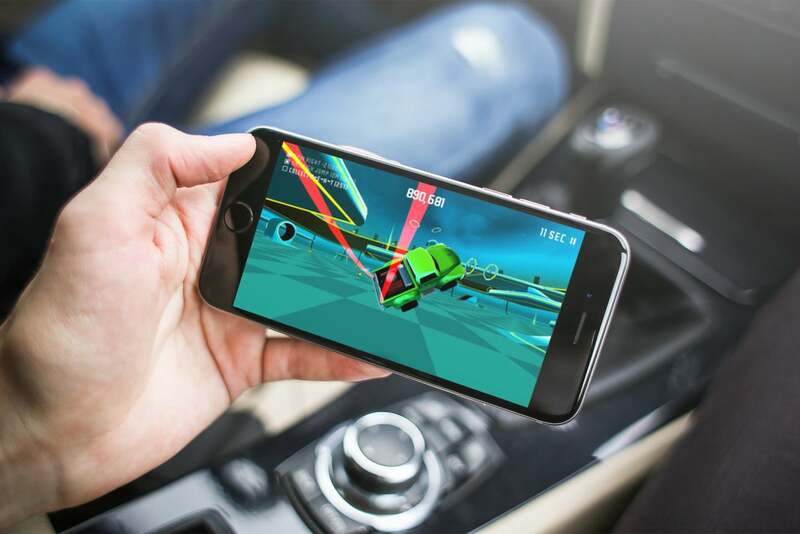 The main objective is to rack up a high score, and you earn points by doing all kinds of stunts and tricks with your chosen car. The more things you do, the more points you earn. Each round has a time limit of 60 seconds, so you are racing against the clock. There are clocks that you can collect to extend your time, but you have to be fast. More cars get unlocked once you reach a certain point threshold, and the type of vehicle you drive can impact how you earn points. So it's important to use these cars as you get them. Controls in REKT! are as simple as they come. The car accelerates automatically, so you don't have to worry about that. To steer left or right, just touch the screen in the direction you want to go in. To come to a stop, just tap on the bottom center area for the brake button. If you tap-and-hold the brake button, the car eventually reverses. 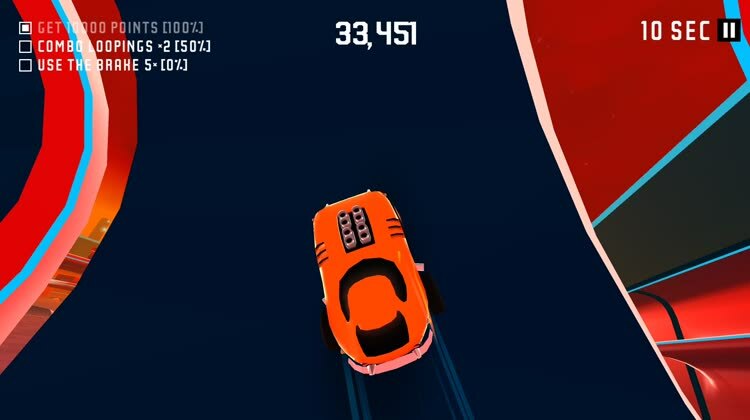 Swipe vertically in the air to do a front or back flip, and swipe horizontally for the car to spin. When you tap-and-hold in the air, it forces it to stop spinning or flipping, which is what you should use if you want to do a perfect landing. Even though the controls are pretty easy to learn, the game requires a bit of practice to fully master them. And once you know the controls like the back of your hand, then doing sick tricks and racking up the points is no big deal. The only annoying thing about REKT! is the fact that there's pretty much just one free-roaming arena. However, to keep things fresh and interesting, you'll have three challenges to strive for before the start of each round. These include goals like "Perform a drift," "Crash through some boxes," "Get a perfect landing," and more. Once an objective is completed, you earn some blue coins and a new challenge presents itself. But what are the blue coins for? When you have enough of them, then you can spend them for a chance to win a new car. However, since the cost is pretty high (1000 per spin) and challenges only give like 30 at a time, it will take a while to accrue enough. REKT! 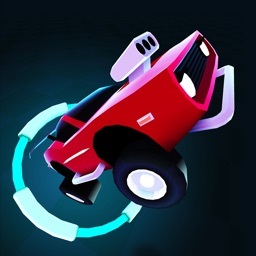 is an arcade racing game where you can burn some rubber and do crazy tricks with cool wheels. REKT! is pretty much a fun time waster arcade game. The graphics are pretty sharp for what it is, and the 60FPS is rather impressive. I love the futuristic design of the arena, which provides great contrast with the modern aesthetics of the vehicles that are burning rubber in it. The soundtrack is engaging and fun to listen to. Controls are intuitive and work out well for the gameplay, but mastering it is still a challenge. The game mechanic is realistic and fun, as you can perform cool tricks without expensive consequences. And while the arena stays the same, the missions keep things interesting and give you motivation to try out new things. While REKT! is a fun little game, it's not perfect. I wish there were more arenas, because going through the same one over and over gets stale after a little while, even with the challenges. I also think that the price for the "Spin and Win" is a tad high, considering that the quests only get you about 30 coins each. Overall, REKT! is proving to be a nice distraction throughout the day. It takes skateboard style tricks and applies them to rad looking vehicles for a unique gameplay concept that ends up being fun and hard to put down. Controls are simple enough for anyone to pick the game up and play it, but mastering the tricks takes time and practice. 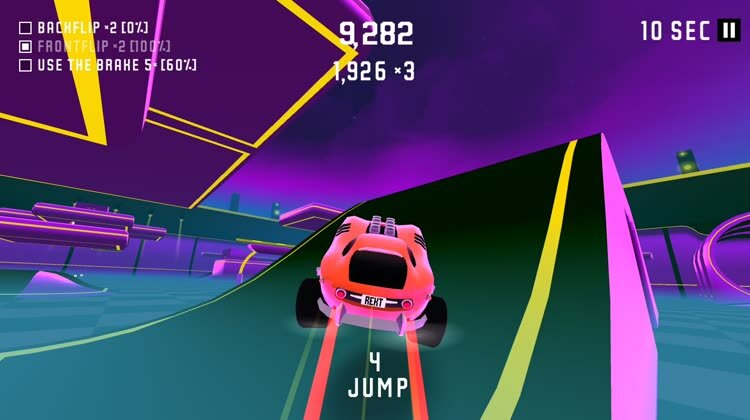 It's also rewarding to watch the points rack up as you hang in the air and spin or flip (or both), and the unlock-able cars just provide more motivation for players. My only complaint is the lack of arenas, but the developers have said that more are coming in the future, according to their app description. Hopefully these come sooner rather than later, and I look forward to checking them out. I still recommend giving REKT! 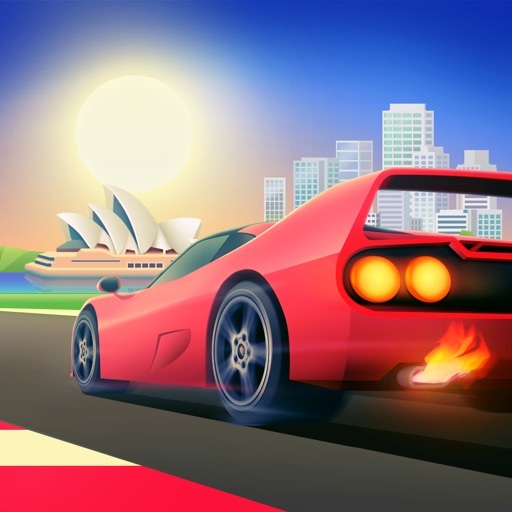 a try if you're in the mood for some addictive driving chaos in arcade game form. REKT! is on the App Store as a universal download for your iPhone and iPad for just $1.99. Little Chicken Game Company B.V.